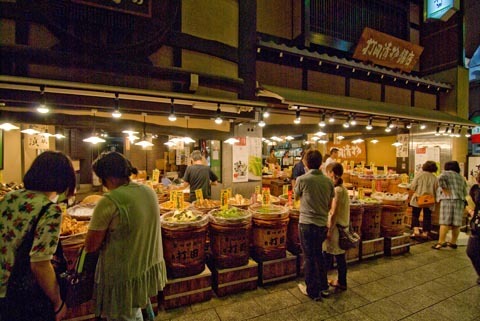 Whenever I’m in Kyoto, I love to go strolling in Nishiki-koji Market. 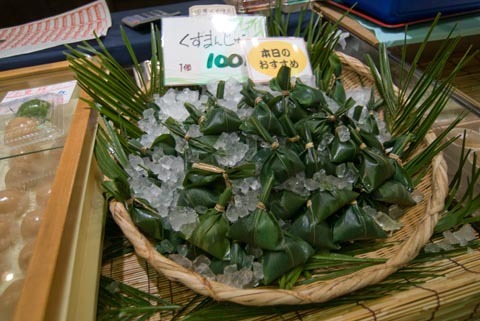 Here are some bamboo-wrapped kuzu manju. 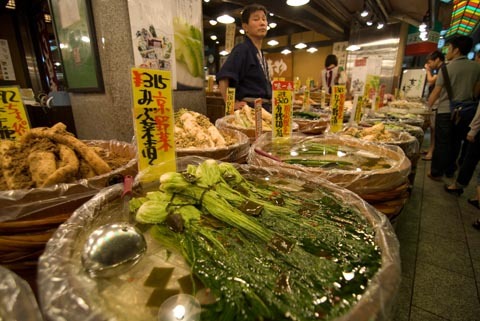 On this trip I really had pickles and dashi on my mind. 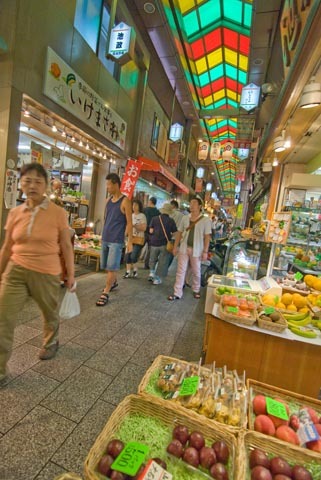 We stopped at the nuka-zuke shop and I bought a few nuka-zuke cucumbers. At another pickle shop we bought some salt-pickled cucumbers. There were some chiles and kombu pieces in the brine too. We liked this one so much that we bought some more. Alex decided that they might be the best pickles in the world–in his opinion, at least. You can see the cucumber pickles in the second vat in the front row. I guess we weren’t the only ones who liked them; they were nearly sold out even though it was still morning. I bought one of these sticks of driftwood. 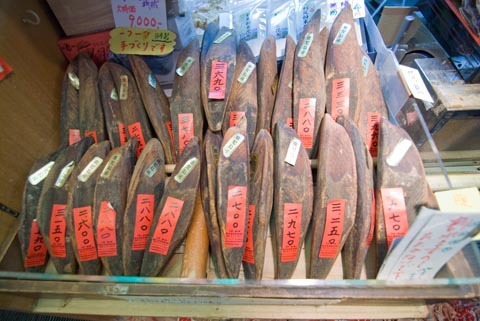 Just kidding, they are really dried katsuo for making dashi. 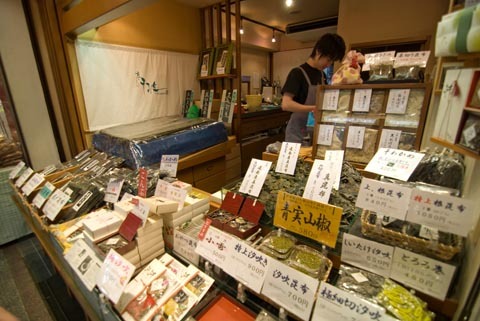 At the kombu shop I bought some dashi kombu. 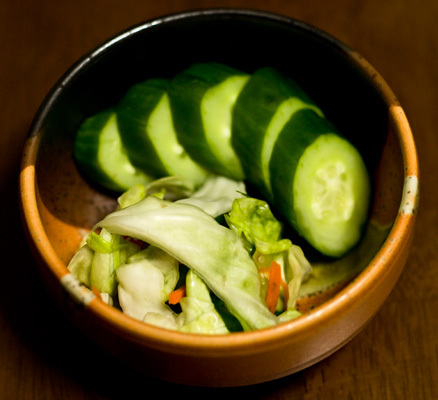 One of the easiest ways to make Japanese style pickles is to use a shokutaku tsukemono ki, or tabletop pickling pot. I picked mine up at Besia recently for under 1000 yen ($10). It’s pretty small, but makes about the right amount for lunch or dinner for two. To use it, I just chop some vegetables (I like a mix that can include cabbage, cucumber, carrot, turnip, daikon, etc. ), rub them with salt, throw in some seasonings like ginger, myoga, or kombu, and then put on the lid and screw it down. The pickling pot has a screw and spring-plate combination that applies pressure to the vegetables, helping to squeeze out their liquid and create a brine that they pickle in. If left at room temperature, your pickles will be ready to eat in just a few hours. 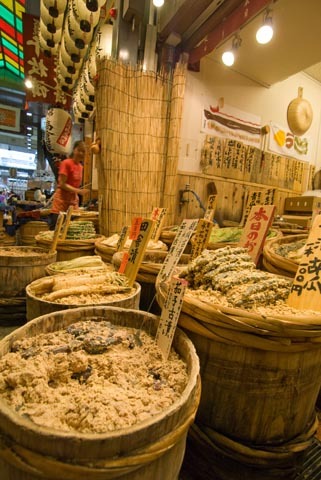 The shokutaku tsukemono ki is a handy device that simplifies the old-fashioned way of making pickles in which cabbages and other vegetables are salted and stacked in large buckets and then topped with lids and heavy rocks so that they can pickle in their own brine. When we visited our friend Tomomi’s grandparents in Okayama last winter we saw their pickling shed, which had several buckets full of home-grown cabbages that had been pickling for a few months or longer resting alongside their homemade miso. The rocks are so heavy that they have a pulley system to help lift them off of the cabbages. Since having a pickling shed like this isn’t feasible for most urban denizens, the tabletop pickling pot is a great kitchen tool for those who still crave the taste of homemade pickles even in an urban environment. 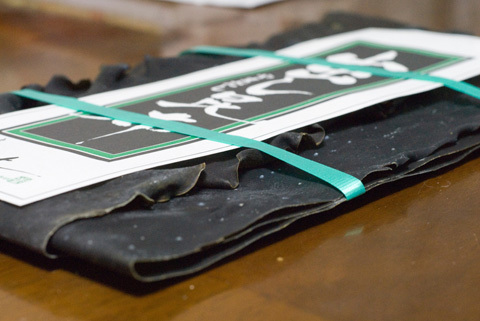 There’s a recipe for “impatient pickles,” a quick pickled side dish made with a shokutaku tsukemono ki in Washoku. I’ve been meaning to write about the Kansha Club more, really, I have. I wanted to write about the last few Kansha Club meetings but I never got around to making most of the recipes. It’s embarrassing really, that I have all these great recipes and advice from the author herself, and I just can’t seem to find time to make them. I have, though, gotten more inspiration to try new dishes from Washoku and some of my other cookbooks. But enough about that, on to the pickles. Our last Kansha Club meeting (the third, if I’m not mistaken) was about pickling. Japanese pickles, or tsukemono, aren’t like the vinegared pickles that you can put up in your pantry forever that you might be familiar with. Some, like nuka-zuke, are quite perishable. There are many different kinds, each made according to it’s own technique, but in essence they are vegetables that have been transformed by drawing some of the liquid out and then developing their flavor with salt, vinegar, fermentation, and so on. One thing that I have made time for recently is my nuka-toko. Elizabeth shared a few cups of her nuka with interested club members so that we could start our own nuka pickling pots at home. I’ve been tending my pot for the last few weeks by turning it daily and checking the additions. My pot is a 3.6 liter ceramic lidded crock for tsukemono. It is narrow at the top and bottom and wider in the middle. Apparently the straight-sided pots are better for nuka-zuke while this shape is good for umeboshi, but I had already bought the pot when I learned that and actually I have had no problems with the shape so far. I started with Elizabeth’s nuka and added about a kilogram of iri-nuka (toasted rice bran) that I had leftover from preparing fresh bamboo shoots earlier this spring and several tablespoons of dry mustard (a special blend available in Japan for making nuka toko). I moistened the nuka mixture with water (you can use beer too) and then added a few cloves of garlic, some togarashi chiles, slices of ginger, fresh sansho berries. Then I mixed it up and put the lid back on. Later I added some more items that Elizabeth had suggested: washed, dried, and crushed eggshells and leftover iriko (dried sardine) heads. I turn the mixture daily to mix and aerate it. It has a bit of a sour, almost peanut-buttery smell that I’ve grown quite accustomed to. After about a week it was ready to pickle. To make nuka-zuke, I scrub my vegetables with salt, rinse, and push them into the nuka, patting the nuka down over the top. In the warm summer, the yeasts in the nuka act quickly, and my pickles are ready to eat in just an hour or two. When you’re ready to eat them, just pull them out of the nuka, turn it, and rinse and slice the pickles. I’ve been sticking with turnips and cucumbers so far, but I think I’ll drop by the pickle counter at my grocery store soon to get an idea about what other vegetables I can make into nuka-zuke.